A wedding or important special occasion should be held in inviting, accommodating, impressive surroundings. Our pristine and well equipped venue is nestled on a quiet country hillside with beautiful vistas of the charming Snohomish River Valley and Olympic Mountain range, ensuring the delight of you and your guests. Whether you’re tying the knot, hosting a business event for VIP clientele, or celebrating an important anniversary or retirement, our all-purpose event venue in Snohomish will have your guests feeling like they stepped into a little piece of Heaven. Designed in a country-style, rustic architecture, take a step back in time while without sacrificing all the modern comforts. Completed in 2015, the Olympic View Estates property includes a rustic barn reception hall, outdoor theater-style seating with 200-occupant capacity, and a fully air-conditioned bridal cottage. Cross the charming stone bridge next to a waterfall as you walk to the wedding altar, or host an anniversary or birthday party in our zen-like ambiance. Fully ADA compliant, our Snohomish wedding venue is registered with the Snohomish Wedding Guild. With lots of room for guests to mingle, we feature an indoor wet bar and gathering hall, and provide plenty of space for you to bring your favorite lawn games to keep folks laughing and entertained during waiting or rest periods. If your wedding or other event is in the planning phase, give us a call or email us to schedule a tour of our facility, then regale your guests at our Snohomish wedding and business venue designed to impress and inspire. We liked this place it is beautiful. They seemed like they would be very accommodating for a wedding. We asked them all sorts of questions and they were very nice and helpful. I asked if we could have played dinners here and he gladly took me to the back kitchen area. It is a prep area but not a kitchen. The view is beautiful! The bridal suite is adorable and the groom's room is really cool. Olympic View Estates was the most perfect setting for my daughter's wedding! Absolutely stunning. Pam and Trent were lovely to work with and have really created a unique venue with everything thought through perfectly. From the bridal suite to the sun shade over the reception area - small touches make it fabulous. We highly recommend OVE - and the pictures?! Picturesque to say the least. Thank you so much! Great local venue with very kind and helpful staff. Nice view overlooking the valley and great catering services. OVE was absolutely beautiful not only with the scenery of the mountains but with the decor and layout of the grounds. Pam and Trent were always helpful and accommodating and helped make our wedding day so special and one to remember. Upon arrival, I was breathless. It is one of the most beautiful, picturesque places to be! The view is most spectacular from early in the day until sunset. I am a professional photographer and the possibilities in this venue are endless! I took TONS of pictures and was honored by Pam -- the owner -- to be the first to take pictures of the bride and groom out on the private wildflower field. Pam and Trent have done a miraculous job on this venue and I would H*I*G*H*L*Y R*E*C*O*M*M*E*N*D this to anyone celebrating their life of together-ness. VENDOR REVIEW: As a DJ it's nice to have "hands on" venue owners who want to see the success as much as I do. With that said I had a great time working with the owners (and amazing coordinator) during a wedding a couple weekends ago and would recommend this to any couple looking for a beautiful and well kept place to hold an event! My daughter and her new husband had their wedding here on September 16. It was the perfect place for their big day. The grounds are beautiful and the view is lovely. Plenty of places for photo opportunities, the venue is well thought out. Thank you Pam and Trent for making the day so successful. We had our daughter's wedding reception at Olympic View Estates on August 12th and couldn't be happier with how it turned out. The venue is beautiful - we had so many compliments on the grounds and facilities - Trent and Pam have thought of every detail! 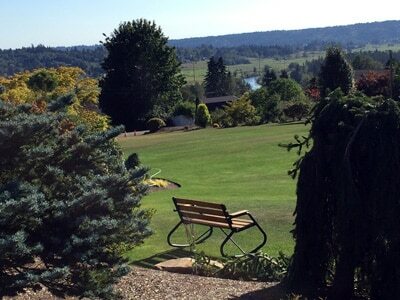 We highly recommend Olympic View Estates for any wedding or event you many have. Heaven on earth!!! Olympic View Estates is absolutely beautiful. We started our journey of looking for a venue a year and a half ago, the moment we met Pam and Trent and toured the grounds of their estate we knew this is where we would exchange our vows. The grounds and venue are a labor of love, it shows everywhere you look, you feel it. The beauty doesn't stop in just the grounds, the bridal suite and reception area is just as stunning. Pam and Trent knew that our wedding was all about family and grandkids, it became even more special when Trent added a play ground for all my favorite littles. I cannot thank you enough. Olympic View Estates is beautiful, Pam and Trent.... perfection. If you are looking for a venue, no need to look further Olympic View Estates is hands down the best place for weddings, family reunions and any other gathering. This venue is the best! My beautiful wife and I were just married here, what a great experience it was. Pam and Trent are amazing to work with the love and passion they have for this beautiful venue shows through every inch of this amazing property. There help throughout the planning of our special day made everything so much easier. I would recommend this venue for everyone looking for that special place for there special day. Thank you Pam and Trent for making our wedding so special by providing such an awesome venue and service your the best. We had a beautiful wedding there just today. Not only is the scenery breathtaking... The owners were friendly and so helpful in making the day perfect. I wouldtruly recommend this place to anyone needing a space for any type of special day. There is also a play area for the kids, which was so perfect to keep them happy during the long day. Thank you both so much for making such a beauty space for us to share. This place is AMAZING. Ran by GREAT people. The first time I saw the grounds, I couldn't believe what the owners had done to create this venue, ALL BY THEMSELVES. Just awesome. We were thrilled to rent the venue for our daughters wedding ! Pam and Trent were fabulous to work with ! Beautiful property , couldn't have asked for more ! Loved Photographing at this Venue amazing with Views of the valley and beautiful lush landscaped. Everything was top Notch! I was part of the catering team tonight. So breathtaking. I would love to get married here! Beautiful outdoor venue with great indoor dining option! We photographed a wedding here June of 2016 and even though the rain it was gorgeous. Pam and Trent were nice to chat with as well as helpful. Gorgeous views and an amazing very helpful staff! The venue was gorgeous! Pam,Trent, and their daughter worked extra hard to get everything in place and to accommodate us. I'd recommend this venue to anyone looking for a wonderful wedding. Thanks for making our day amazing! I would recommend this venue for anyone looking for a scenic outdoor space with rustic charm. I coordinated a wedding here this weekend and was blown away. Beautifully landscaped gardens, gorgeous rustic buildings, and breathtaking views of the valley! As someone who's been to countless weddings at other venues, I can honestly say this was one of the most beautiful ceremony sites I've ever seen, and every detail of the property was perfect. They're a newer venue, and I can't wait to see what else they do with it! Major plus: wonderful on-site owners who truly care about and have vision for this place. Highly, highly recommend! The Wedding of Zach and Camie from West of Wonder on Vimeo. Copyright © 2019 Olympic View Estates All Rights Reserved.